June is National Fresh Fruit and Vegetable Month, and I thought it would be a chance to highlight some great programs MSU Extension offers as well as some helpful resources that you can use with your families. Here are five things to know to celebrate National Fresh Fruit and Vegetables Month. MSU Extension’s Michigan Fresh campaign helps people explore the state’s bounty of fresh, locally grown fruits and vegetables. The cross-institute team of Agriculture and Agribusiness, Heath and Nutrition and Greening Michigan staff provide fact sheets with recipes, gardening tips and preservation techniques for over 80 Michigan-grown foods available for free online at MSU Extension offices and in over 20 farmers markets across the state. The Michigan Fresh team also has a series of newspaper articles available at this link on Sharepoint for customization and distribution to local media outlets by MSU Extension offices. Be sure to follow Michigan Fresh on Facebook, Instagram and check out over 1,800 recipes on our Michigan Fresh Pinterest Thanks to Health and Nutrition Institute team member Ellen Darnall, we have a new series of recipe videos. Check them out online at the MI Health Matters Facebook page. Recipes include Michigan asparagus guacamole, Michigan blueberry muffins, Michigan berry yogurt parfait, Michigan maple syrup balsamic vinaigrette, Michigan broccoli salad, and more! If you would like more information about Michigan Fresh or would like to join the team, please contact Kendra Wills. Where is your local farmers market? Planning on traveling around Michigan and want to find one during your trip? The Michigan Farmers Market Association has a comprehensive list and map of all of the markets in Michigan. Find your local farmers market and bring fresh, locally produced fruits and vegetables into your kitchen. Interested in planning your own vegetable garden? MSU Extension has a webpage dedicated to providing resources on when and where to plant. It also covers building garden soil, managing pests, planning your garden and harvesting vegetables. The site also contains growing tip sheets A to Z, from asparagus to turnips. Hoping to find ways to add more vegetables and fruits into your eating habits? In her article, “June Is National Fresh Fruit and Vegetable Month,” Zelda Felix-Mottley helps us take an inventory of our eating habits and gives us tips on increasing our fruit and vegetable consumption. I hope this information let you know a bit more about our wide range of resources that help our communities and can also help you. Have a happy fruits and veggies month! It’s always great to be able to tell our story and get the word out about Michigan State University Extension’s contributions to the state’s residents. One method of communication is radio. His program airs every Thursday at 1 p.m. and 7 p.m. It can be downloaded afterward anytime online as a podcast. Each session, Andy focuses on a theme and all six interviews that hour tie to that theme. Check out the Michigan Business Network website to listen to more shows that include MSU Extension educators. If you have a business-related topic you’d like to discuss on the air, contact Andy at ANDY@NORTHERNLAKES.NET. We’re grateful for the opportunity to communicate our message. In a March 27 Spotlight, I mentioned how our Michigan State University Extension Michigan Fresh program educates on fruits, vegetables, flowers and ornamentals as well as food safety, food storage, food preservation and gardening. In addition to this long list of important subjects, the Michigan Fresh work team is also busy on many other projects. Extension educator Eileen Haraminac took over the coordination of the Michigan Fresh team upon Kathe Hale’s retirement. Other future fact sheets will focus on Michigan chestnuts (Erin Lizotte, Extension educator in the Agriculture and Agribusiness Institute) and growing hops (Greening Michigan Institute Extension educator Rob Sirrine). Extension program instructor Stephanie Bruno heads up the team that’s developing recipe cards. The team consists of Jennifer Berkey, Becky Henne and Connie Kurple. These new recipe cards will be distributed at several farmers markets to encourage consumers to purchase Michigan-grown food to use as simple ingredients. Kristine Hahn and Eileen Haraminac as well as Sean Corp and other MSU Agriculture and Natural Resources (ANR) Communications staff are collaborating with the Eastern Market Corporation to promote a new product ‒ Michigan Fresh Frozen fruits and vegetables. The group is working on recipe cards to be distributed at Detroit Eastern Market and through the Peaches & Greens mobile produce trucks. The cards will promote both the Michigan Fresh program and the new Eastern Market Corporation Michigan Fresh Frozen products. Eileen said, “We want to encourage people to choose nutrient-packed frozen fruits and vegetables when fresh are unavailable. Fruits and vegetables chosen for freezing are processed at their peak ripeness ‒ time when, as a general rule, they are most nutrient packed. Extension associate program leader Becky Henne heads up the social media team. Team members are busy working to build a smartphone app and to develop additional videos. They hope to have the app ready to roll out for the 2015 season. This group is working with Dr. Dru Montri, executive director of Michigan Farmers Market Association; Colleen Matts, farm to institution outreach specialist with the MSU Center for Regional Food Systems; and Dr. Norm Lownds, curator of the 4-H Children’s Garden. Additional team members from both the Health and Nutrition Institute and the Greening Michigan Institute include Julie Darnton, Joanne Davidhizar, Dawn Earnesty, Kristine Hahn, Sheilah Hebert, Maggie Kantola and Kendra Wills. Dr. Cheryl Peters, Maggie Kantola and Kendra Wills have been working with the Michigan Fresh team to develop a common evaluation tool for Michigan Fresh cooking demonstrations offered at the Detroit Eastern Market and the Grand Rapids Downtown Market. These cooking demonstrations benefit the promotion of the Michigan Fresh fact sheets and videos. The free, public demonstrations are designed to inspire people to purchase and consume more Michigan-grown fruits and vegetables. The evaluation tool will gather information from cooking demonstration observers. Recipes used in the cooking demonstrations come from the Michigan Fresh fact sheets and the U.S. Department of Agriculture. With coordination from Extension educator Terry McLean, MSU Extension will staff a kiosk at the Flint Farmers Market this spring. Michigan Fresh is a great collaboration not only between our own institutes but between local organizations and farmers markets as well. If you are interested in promoting the Michigan Fresh campaign materials at your community farmers market, please contact Eileen Haraminac (haramin2@anr.msu.edu) for more information. Patrick Cudney, Michigan State University Extension District 3 coordinator, recently let me know about a tour he and members of the District 3 Extension Council took. 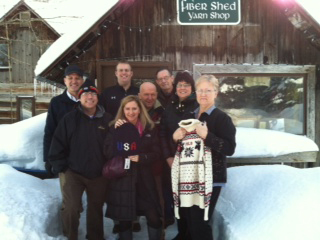 They visited the Stonehedge Fiber Mill in East Jordan, Mich., following their council meeting Jan. 20. What’s so special about that? The mill prepared the yarn for the sweaters and hats designed by Ralph Lauren that Team U.S.A. will wear in the 2014 Winter Olympics closing ceremonies. Not only that, the fiber mill has its beginnings in a 4-H experience. Members of the District 3 Extension council toured the Stonehedge Fiber Mill in East Jordan, Mich., following their council meeting Jan. 20, 2014. When Debbie McDermott, the mill’s owner, learned to knit at the age of 7 from her grandmother and continued knitting and sewing as a 4-H’er in Hillsdale County, it sparked an interest in fiber. Then in 1989, her daughter began raising two sheep as a 4-H project. The experience with the two sheep led to what is now a company that employs 14 people including family members. Debbie later served as a 4-H leader in Charlevoix County, continuing the 4-H legacy. Debbie and her husband, Chuck, along with Mary Faculak, District 3 Council chair and state council member, met with Gov. Snyder in December 2013. 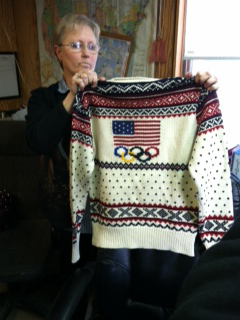 The McDermotts gave the governor an Olympic sweater for his work and support of agriculture in Michigan. Sometimes we have a good idea, it works out well so we branch out and use that same idea elsewhere. Actively promoting our Michigan State University Extension programs at the Detroit Eastern Market proved successful. We had a great reaction and so when the opportunity came to join the Grand Rapids Downtown Market, we were ready and excited to be a part of it. In the June13 Spotlight, I mentioned plans to house MSU Extension staff in office space in the new indoor market. The plans are now a reality. Community food systems educators Kendra Wills and Garrett Ziegler are officially moved in as of Sept. 1 and are working on site full time. Diane Smith, innovation counselor from the MSU Product Center Food-Ag-Bio, joins them one to two days a week. Our presence at the market is a great opportunity to educate the public and establish relationships with people who produce local food as well as those who buy it. The way I think of it is although market shoppers may not expect to see MSU Extension at the market, when they do see us, they immediately “get it.” In a way, it’s a place where we belong because it’s a place where people are seeking information along with their food, and we can help them whether it’s in providing nutrition, cooking, food safety or gardening information and education. And we want them to associate us with receiving access to dependable, unbiased, research-based information concerning food as well as other issues that affect their families and their communities. The market has both an indoor market open every day and an outdoor market open two mornings and one evening a week. The indoor market officially opened on Labor Day, Sept. 2. According to WZZM ABC News, nearly 30,000 people showed up for the grand opening. We’ve already been active in the outdoor market since it opened May 4, promoting our Michigan Fresh campaign and educating about healthy eating, and safe food preparation and preservation. In addition, we’ve used the indoor facilities for educational sessions. In the Aug. 15 Spotlight, I wrote about two health and nutrition educators, Jeannie Nichols and Rita Klavinski, who facilitated a ServSafe class to 23 participants. We intend to continue offering educational programs using the indoor facilities, which include demonstration and teaching kitchens, greenhouses and a commercial kitchen incubator. Jeannie will hold a Cooking for Crowds session on Oct. 9. Cooking for Crowds is an educational program focusing on food safety for nonprofit groups who prepare food for their members or for the public as fundraisers. Jeannie and Diane will co-teach “Starting a Successful Cottage Food Business in Michigan” on Nov. 7. The program combines the business and food safety aspects of preparing and selling cottage foods safely and successfully. Extension educator Glenda Kilpatrick reports that Kent County 4-H program coordinators Kristi Bowers and Christine Mickelson have been offering youth programs on Tuesdays at the market as well. Expect many more programs to come. Previously, I wrote a Spotlight article about the plans of Michigan State University Extension to house staff in a new office at the Grand Rapids Downtown Market. This will be an addition to our footprint in Kent County, complementing our county office location. Community food systems educators Kendra Wills and Garrett Ziegler will be based in our new office when the market opens officially in September. In addition to serving clients directly with their efforts to expand access to locally grown foods in institutional settings, they will help to connect clients with other programs MSU Extension offers as well. MSU Extension educator Jeannie Nichols presents a ServSafe class at the Grand Rapids Downtown Market Aug. 14, 2013. 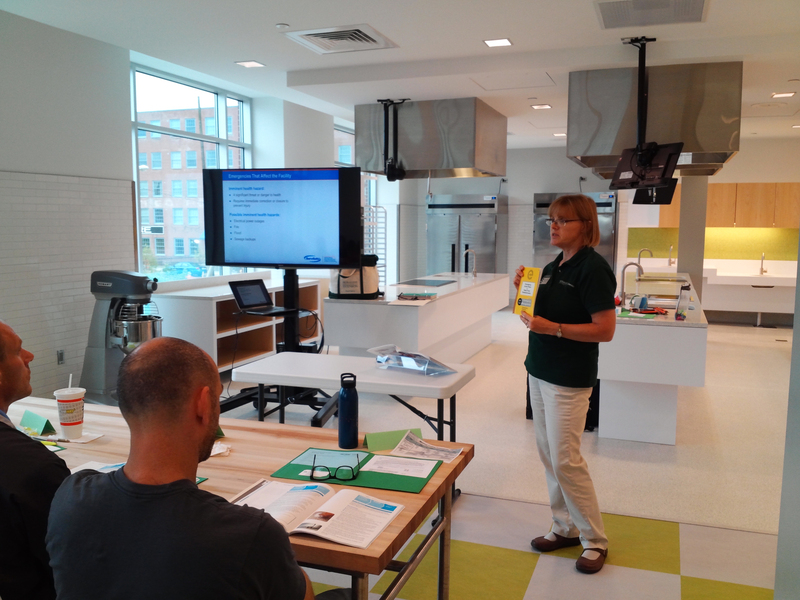 On August 14, health and nutrition educators Jeannie Nichols and Rita Klavinski held our first official class in the Downtown Market, a ServSafe class that served 23 participants. Some of the participants were vendors with food businesses in the market. They also had several school food service workers and a few participants from the kitchens of local breweries. Kendra reports that Jeannie and Rita did an excellent job working through the logistics of the new space and working around the ongoing construction. You can view a few photos on my blog that Kendra provided from the class. This was the first class for adults held in the new, state-of-the-art teaching kitchen space. Thanks to Kendra, Garrett, Jeannie and Rita for putting our footprints in the drying concrete. 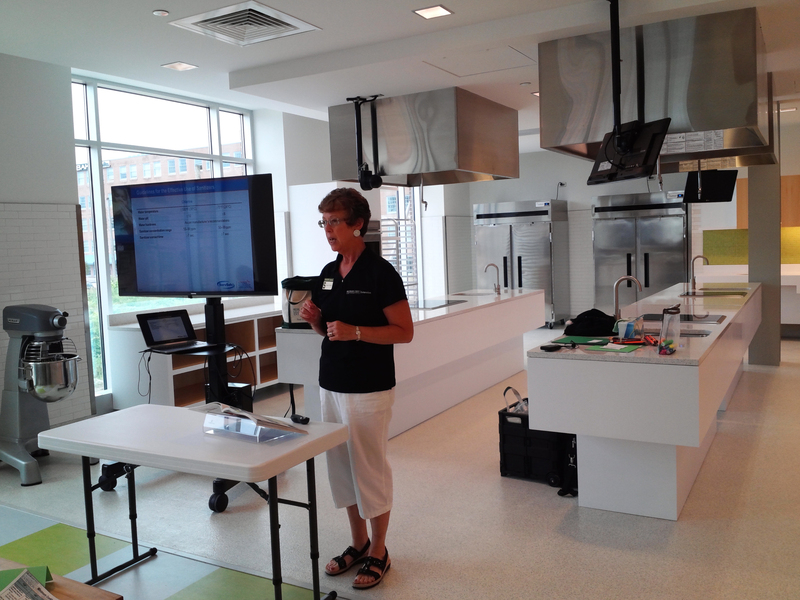 MSU Extension educator Rita Klavinski presents a ServSafe class at the Grand Rapids Downtown Market Aug. 14, 2013.